Should Uber be surprised by their recent backlash? The short answer is no. Any company, person, or group with a large platform is judged by their decisions in and out of the office. Every employee and their actions are judged and associated with the company they work for. Uber has come under fire for offering no surge prices during the New York City Taxi strike. In an act of protest against Trump’s Immigration Ban, New York Taxi Workers Alliance said they would not be picking up passengers from JFK airport for an hour. 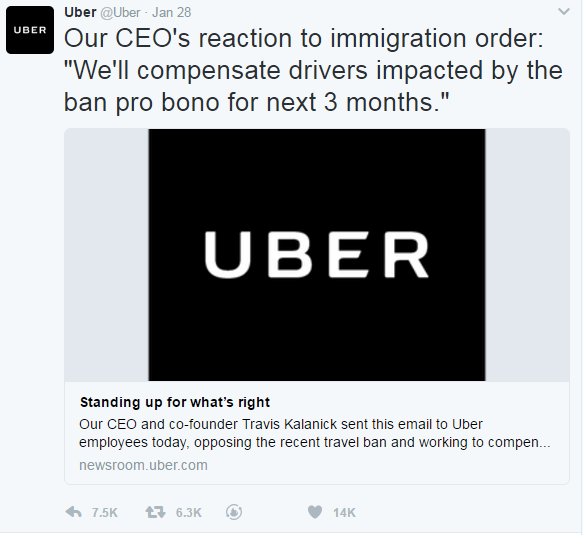 Uber defended their position “to turn off surge pricing [saying it] was made specifically to avoid profiting from increased demand during the protest” (Fortune, David Z. Morris). Unfortunately for Uber this is not how the public interpreted it. Many took offense and saw it as Uber capitalizing off of the protest. Uber’s top competitor, Lyft, took this opportunity to make their opinion very clear. 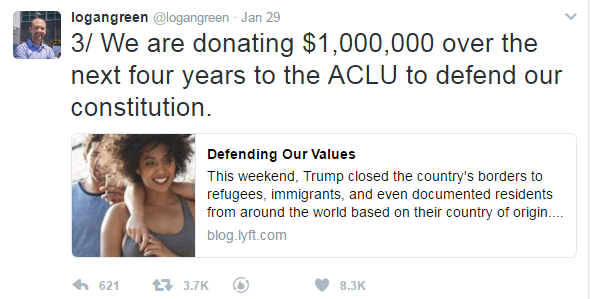 In a public tweet, their cofounder, responding by donating $1 million dollars to ACLU (American Civil Liberties Union) over the next four years. With Uber and Lyft’s seemingly opposing views, social media began trending the hashtag #deleteuber. Meaning, delete your Uber app, and encouraging the public to move to Lyft. Uber is a transportation company, yet they are getting backlash for providing rides. Why? No company or person with a large following can pick and choose when they want to be influential. President Obama was videotaped singing a line from Al Green’s song “Let’s Stay Together,” and sales of the of the song soared 490% (Investopedia). 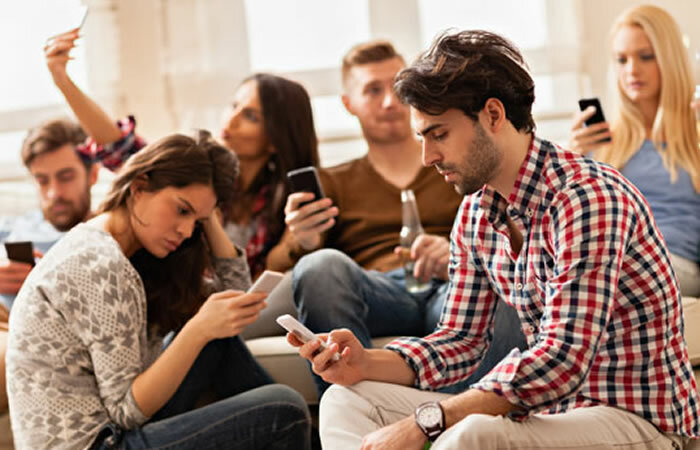 A public facing company or person always has influence with their audience. Uber’s misrepresented tweet offended the public more than their need for transportation. The question is not whether there is an influence, it’s how much of an influence you have. The product or service a company offers is only part of why customers buy from them. More than ever, a company’s public image and political views influence their clientele. Having a large following and clientele is a privilege. As a business, the more clients you have the more opportunity you have to make money. If a celebrity puts their name on a product, the value can increase immediately. According to Forbes, a brand that inks an endorsement with a celebrity or athlete can see their stock rise up to .25 as soon as the news is public (Forbes, Steve Olenski). When a company’s influence is used for profit, the audience will tell you if they approve or not. There is no such thing as companies being politically neutral anymore. Countless businesses wish they had a platform or opportunity to show what they have to offer. Businesses today have to keep in mind that “with great power comes great responsibility” (Uncle Ben). Lyft and Uber are transportation companies, but their platform reaches much further than rides going from A to B. Large companies are responsible for their impact and sending positive messages. You can’t take the good (large audience) without the bad (public scrutiny). People are watching, listening, and waiting to see what you do next. There is enormous pressure for companies to “do the right thing”. Uber learned the hard way with over 200,000 people deleting their app after the recent backlash (Business Insider, Biz Carson). Even with Uber’s attempt at damage control to their image, it is going to take a lot to recover. Companies can no longer remain neutral. Uber is a transportation company, yet providing rides caused a massive loss in clientele. The loss has nothing to do with a bad ride, a car accident, or customer service. It has to do with their political views. It should be no surprise to Uber that their decision to provide rides during the New York Taxi strike had an impact. A company is judged by their actions outside of their product, and time will tell if/how they will bounce back.